St. Luke. A Greek speaking pagan from Syria, he was a physician in Antioch. Not an eye witness of Christ, he was the faithful companion of St. Paul on his travel. Paul mentions him 3 times in his epistles; as “our most dear physician” in Colossians 4:14; as a “fellow worker” in Philemon 24., as his only companion towards Paul’s death in 2 Timothy 4:11. St. Luke wrote the 3rd Gospel and the Acts of the Apostles. We can learn some medical details from these writings. In his Gospel there are just over 30 “medical” situations, all to do with healing of the body and the spirit. His careful recordings and succinct summaries are an example to us today. The man with the withered right hand healed on the Sabbath “restored as whole as the other’ (Chap.6). In Chapter 8, at the raising to life of Jairus’s daughter, Jesus is not too busy to heal the woman troubled for 12 years with an issue of blood; she had “spent all her living upon physicians …. but couldn’t be healed of any”; touching his garment was enough to staunch the blood. A child in Chapter 9 has an epileptic seizure well described. On the Sabbath again Jesus heals a man with dropsy in Chapter 14. On and on, the blind, the deaf, the dumb, the lepers are healed. There are also some famous passages only in Luke’s Gospel; at the Visitation, the child “leaps in the womb” of Elizabeth; Jesus’s saying “physician heal thyself”; the Good Samaritan also. In the Acts, a great deal more healing goes on; a man lame from his mother’s womb, a man above 40 years old impotent, made whole; another sick of the palsy 8 years; yet another man at Lystra, powerless in his feet, being a cripple from his mother’s womb, who had never walked. St. Luke record St. Paul raising Eutychus from death after falling asleep out of a window whilst listening to him. 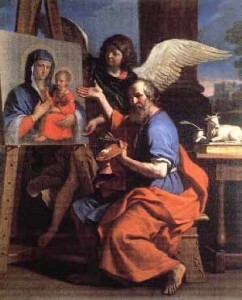 St. Luke must have continued practising as doctor to St. Paul and those around him; but he is also remembered for his great devotion to Our Lady and his paintings of her; not only is he a patron of Doctors but also Painters. He is said, to have died aged 84 by being crucified on an olive tree at Elaea in Peloponesia. 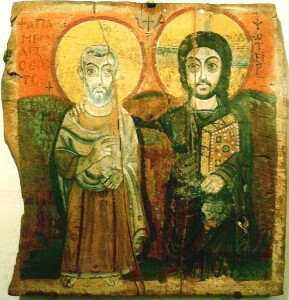 On the right is a painting which comes from the monastery of Bawit in Middle Egypt. Dated to the late 6th or early 7th century, it represents Christ on the right, and Abbot Mena, the superior of the monastery at the time. The painting captured the friendship between God and man in a beautiful way. The abbot holds a scroll in his left hand; this may have contained the rules of his monastery. 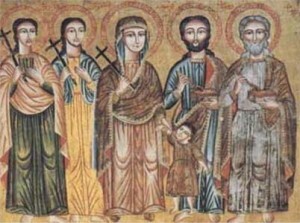 Early Christian physicians and martyrs. They were twins, born in Arabia, and practised the art of healing in the seaport Ægea, now Ayash (Ajass), on the Gulf of Iskanderun in Cilicia, Asia Minor, and attained a great reputation. They accepted no pay for their services. In this way they brought many to the Christian Faith. When the Diocletian persecution began, the Prefect Lysias had Cosmas and Damian arrested, and ordered them to recant. They remained constant under torture, in a miraculous manner suffered no injury from water, fire, air, nor on the cross, and were finally beheaded with the sword. Cosmas and Damian are regarded as the patrons of physicians and surgeons and are sometimes represented with medical emblems.